This fits perfectly in my shower and it does not slide, so therefore I feel much safer, as one gets older this is very important. 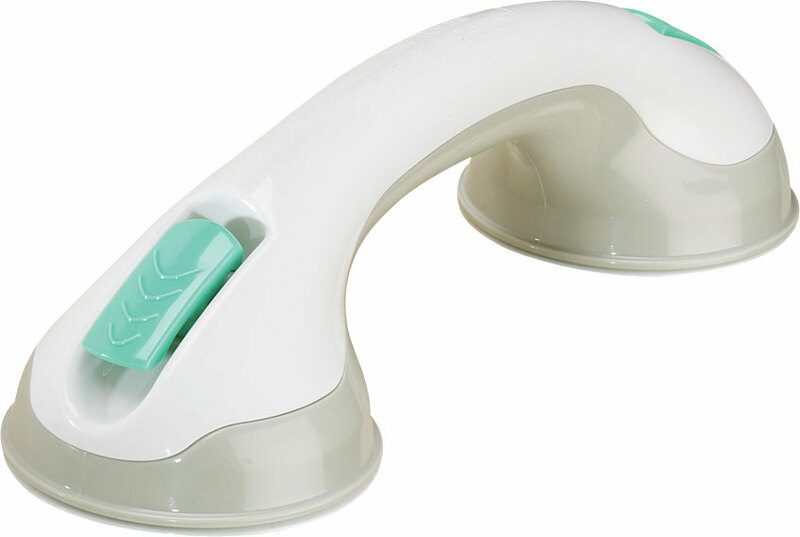 It also cleans easily and when I need another one, I will order another. It is soft and very comfortable under your feet. I have been looking for a shower mat for quite some time - so glad you carry this mat! 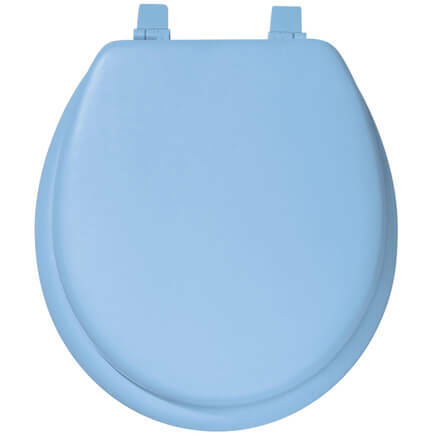 White color is great, easer to clean, most of all, it is Safer for me a Handicapped person. 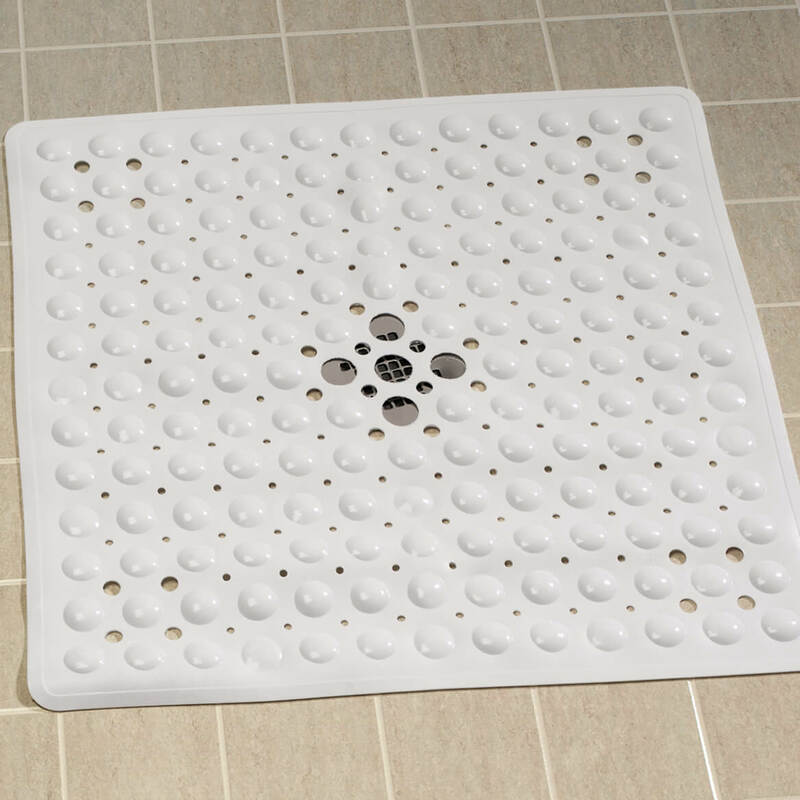 I like this Shower Mat for my Bathroom, fits perfect and the water goes right down the drain. I bought for master shower. 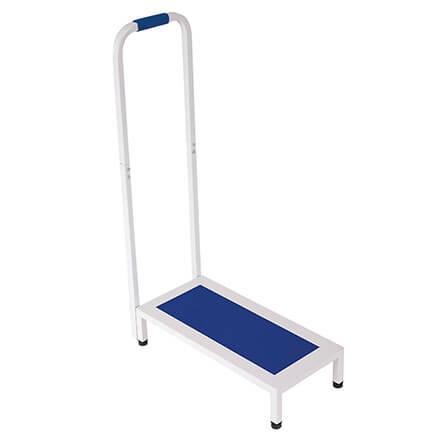 Stand up shower and this gives us better traction when showering. I have tried several brands of shower mats for my husband who has neuropathy in his feet. Most won't stick firmly because of the shower floor's slightly textured surface. And others hurt his feet. This one solves all those problems. A good safety feature and easy to use. Keep showe safe and clean. I do not recommend this shower mat as it was totally unsafe when I used it. Especially when soap is present. It also has a strange smell. There is no mention as to what it is made of. I recently sprained my ankle and, although the shower floor isn't greatly slippery, it will help with stability. I have a large walk-in shower that can get slippery with soap and shampoo usage. This will fit nicely around the drain for safety. We have a smaller shower in our family room bathroom and I hope this fits nicely. Whoever had it put in didn't have the drain centered. Shower tile can be cold on the feet. This keeps my feet warm. Also clear so the tile shows through. 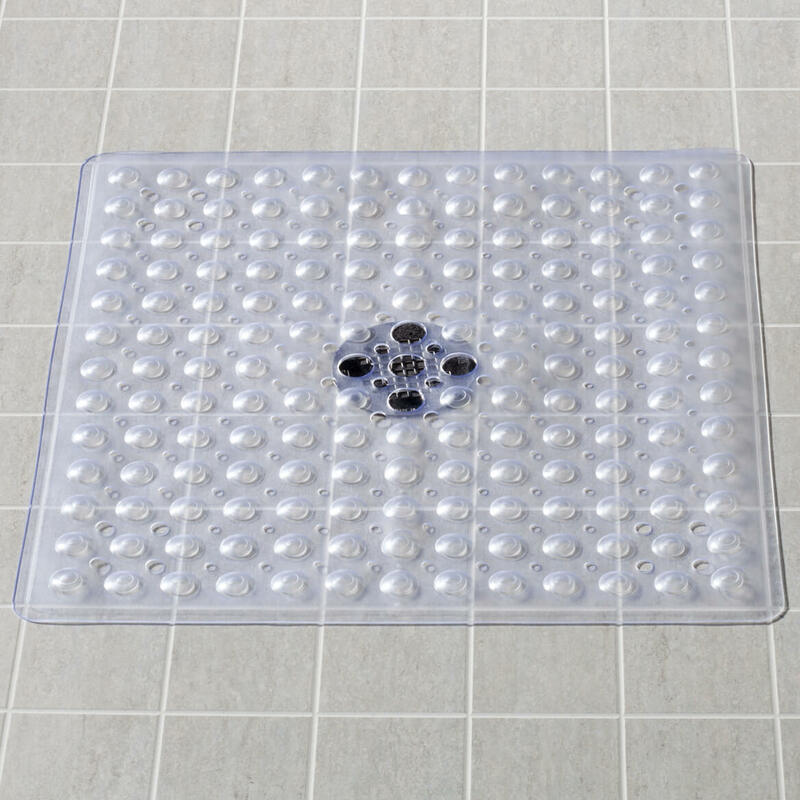 Have been unable to find a mat for our shower in stores, Need it to be a little safer in shower. Reviews hit on the facts I needed. 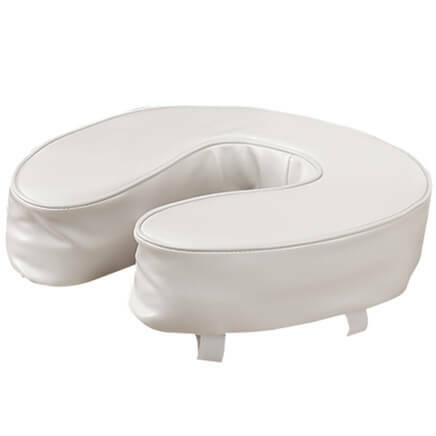 Main review, comfortable on feet since I have very sensitive feet. 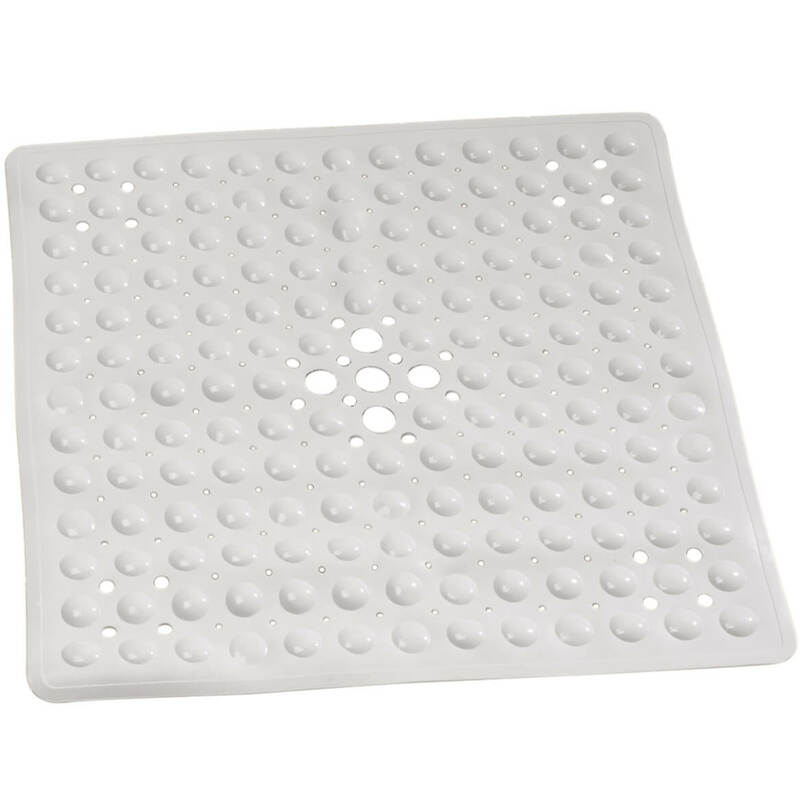 We needed to replace the shower mat in our hallway bathroom, so we decided to buy the square mat made like the rectangle mat that we bought for our master bathroom. Taking a shower without a shower mat is dangerous, especially as I am older. I have had one before and was happy with it. 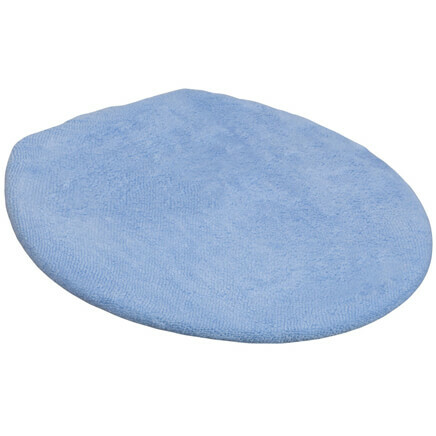 Was looking for a shower mat with a center drain and is machine washable. After back surgery, I dare not fall. Needed to update my old one, and this square one fits the bill. Don't want to slip in the shower. so I don't slip and fall. This shower mat is very economically priced and works well. It fits my shower stall perfectly and it actually stays in place! I would definitely recommend this product. this mat is very very good for the shower. Just the right size for my shower. Makes standing in the shower a little sturdier. Purchasing this for a friend. Fits the shower nicely. Fit, style and price is right! Because I needed a small mat for my shower. what size is it? Dimensions? BEST ANSWER: Thank you for your question. The mat is 21" Square. We hope this information will be of help to you.